The rural church situated in the environs of the town of Limoux and which is known by the name of Notre Dame de Marceille has not been the object of any deep study on the part of the archeologists or the historians; but it has served as the theme of several hagiographic articles. The land on which this chapel is built formed in the eighth century a simple Freehold joined to the village of Pomas, situated a short distance away. (Allodium de Marcilia et de Pomari). This Freehold was considered by the religious of the Abbey of Lagrasse as composing part of the domain of this establishment in virtue of the concession made by Charlemagne and by Charles-le-Chauve and confirmed by Pippinus, king of the Aquitains. The Freehold of Marceille figures, in fact, in the inventory of goods of this abbey drawn up, in 1521, by the syndic of the monastery and the knight of Durfort. But this was only therefore an honorary title, as for a long time already this Freehold had passed into other hands. On his side Oliban, count of Carcassonne, could avail himself of donations which had been made to him by Charles-le-Chauve and in which this Freehold figures (870-877). Finally the abbey of St Hilaire in 980 laid a claim to the Freehold of Marceille, in virtue of the donations which Count Roger and Countess Ad�lais had consented to this monastery with the authorisation of Pope Benoit VII. From this time, the abbey of Saint Hilaire became in possession of this territory on which was founded a simple religious station called Cellula. Marcilia became from then one of the four Celluloe which marked, so to speak, the religious resting places, placing the monastery in relation to Carcassonne on one side and Limoux on the other. On the road from Carcassonne, one crossed the Cellula of Verzeille of which the ruins still remain, which one notices near to this commune near to the railway track. Then one saw the Cellula of Corneillle, a neighbour of the hamlet of this name on the right bank of the Aude and which is remarkable today by its considerable remains in four pillars in a good state of preservation. On the road from Limoux one found Saint-Jaume, or Saint-Geni�s, near to the village of Pieusse and the Cellula of Marceille, which became later the rural church with which we concern ourselves in this study. In the eleventh century the Freehold of Marceille belonged to a lord by the name of Arnaud Siguinus who having entered into religion made a donation of all his fortune to the house of the Holy Sepulchre at a place named Aygues-Vives, in the county of Carcassonne. In this donation figures a sum of six ounces of gold due to Siguinus by the owner of the Freehold of Marceille which owned it by the title of arri�re-fief. Authentic documents are missing when one tries to determine the time of the actual construction of Marceille; but legend is caught by this subject and it is in this way that the story is preserved in the town of Limoux and the neighbouring areas. It is said that a labourer was working his field and that his oxen stopped and refused to move on, even when urged by the goad. The surprised labourer studied the earth at the point where his team of horses would not go further and discovered a statue of the Virgin in a brown colour and in a good state of preservation. The labourer brought home this pious relic; but the following night the statue had disappeared and it was found again in the field where it had been discovered. Some pious people considered this as a supernatural sign giving the indication that this place was destined to the foundation of a religious station, and the church of Notre Dame de Marceille was created on this privileged land. In all of this legendary story transmitted in this way from age to age there is a historic aspect. One must therefore admit that the statuette displayed today in the chapel of Notre Dame de Marceille was discovered a long time ago, in the area which this religious building occupies. We know, in fact, that at the time of the Saracen invasion, in the eighth century, the churches and chapels were pillaged and sacked in the country of Gothie, and that the terrified population hurried to flee into caverns and into silos with everything that they could save from the rapacity of these barbarous hordes. There is therefore reason to believe that the virgin of Marceille was buried at this sinister time, and that discovered later, whether accidentally or deliberately, thanks to several indications preserved with care, she was housed in the Cellula that the Religious of Saint Hilaire founded at this place. Then, when this primitive private chapel became the current church, this relic was placed there, the object of a very special reverence. In the absence of any act, charter or diploma, informing us of the date of foundation of the church of Marceille it seems difficult to clarify this historic point. We shall try to resolve this important question. Following the violent crisis which crossed the country of Gothie during the crusade against the Albigensians a great religious movement was created in this area, and showed itself in the pious foundations on various parts of this territory. From the other side, a work of urban and rural concentration and conglomeration operated rapidly and led to the foundation and population of certain towns such as, for example, Limoux and several villages situated in the same region. Desiring to keep to our subject we shall not cite other examples. This transformation led to the creation of rural churches in fairly large numbers. We do not hesitate to place Marceille in this category. We believe even to be able, in proceeding by comparison, to indicate the date of this foundation. There exists on the territory of Caudi�s in the ancient county of Raz�s a rural church dedicated to Notre Dame de Laval. "L'an MCCCLXXXIII et l� XIII del m�s d� mars fuet commensat l'oratori." After having passed this gate, one enters a via sacra, or pilgrim's road, with a fairly steep slope, paved with stones and marked transverally, from distance to distance, by a seat of white stones. The church stands at the end of the via sacra within a courtyard and is flanked by a porch decorated on its two sides by solid banks of stone. Such is the short description of Notre-Dame de Laval, built in 1433, and we find at Notre Dame de Marceille the same architectonic conditions, but in much larger proportions. The via sacra is established in the same conditions. We can therefore establish the there was a great similarity between these two religious buildings, and we conclude from this that, in all probability, their foundation dates from the same time. What supports our opinion, is that the porch of Marceille was built in 1488, that is to say soon after the construction of the chapel or even at the same time. This porch is fairly large, and covered by an arch whose ridges rest on clusters of small pillars. Hic puteus fons signatus. Parit unda salutem, gerjunge fidem, sic bide, sanus �ris. The nave contains some fairly remarkable paintings. One of those above all, The Temptation of Saint Anthony, is justly considered as a work of great merit. On the left side of the nave joining the sanctuary and linked with this part of the building one must stop in front of the chapel specially dedicated to Notre Dame de Marceille. Nolite considerare quia fasca sum. Numerous ex-voto tributes decorate this chapel. The sanctuary is of a good architectural and decorative style. One finds there some sculptures and some bas reliefs which attract the attention. One notices at the side of the church and linked with it a fairly large Building in which have been housed, for several years, the group of priests of the Mission who have the title and role of diocesian Missionaries. Within the vast courtyard which extends to the south in front of this religious building there has been built a short time ago a garden which contains a colossal statue of the Virgin. A hydraulic pump raises the waters of the Aude up to the plateau where they are received into a vast basin. Two roads coming from Limoux give access to the chapel. One is the navigable road from Limoux to Saint-Hilaire. The other is a short section of an old road following the same direction and which has been preserved with its religious character. This is the sacred road which the pilgrims follow. The patron saint's day of the church is the eighth of September, and during fifteen days numerous pilgrims come not only from the neighbouring villages but from Roussillon and from the Ari�ge to worship Notre Dame de Marceille. Since its foundation the church of Marceille has passed through different hands. There is reason to believe, as we have already stated, that created by the monks of Saint Hilaire who owned part of the town of Limoux and notably two mills from this town, this place of pilgrimage passed in the sixteenth century into the hands of the Archbishops of Narbonne. In the course of the eighteenth century, Notre Dame de Marceille was given by the Archbishops of Narbonne to the Doctrinaires, who had a college at Limoux, and who kept this chapel until the Revolution. At this time it was bought by four inhabitants of Limoux and since then it has remained private property. If Notre Dame de Marceille does not have its historian, it has had at least its chroniclers and its poet, all natives of Limoux. The first among these, Mr H. Fonds-Lamothe, has done remarkable work on the historic past of his native town. Doctor L. Buzairies in his history of the castles and in his various articles has also dealt with this subject. Neither could leave forgotten Notre Dame de Marceille and have written some very interesting pages on this religious building, but they have taught us almost nothing of its history. Besides these writers I am happy to cite the name of Mr Firmin Jaffus who has left among us a precious souvenir in relation to this matter. Amongst the numerous poems of this fervant man of Letters, one notices a work of the first order, in the form of a letter addressed to Monsignor de La Bouilleire and which is entitled : Notre Dame de Marceille. I am happy to cite the names of these three writers that our Society would be honoured to count amongst its members. � Louis F�di� was a member of the Soci�t� des Arts et des Sciences de Carcassonne, which he joined in 1873. This article was published in 1890. He is also the author of "Histoire du Compte de Razes et du Diocese d'Alet" (Carcassonne, 1880) and "Histoire de Carcassonne, Ville Basse et Cit�", as well as several articles in the journal of the Soci�t� des Arts et des Sciences de Carcassonne. � Henri Boudet joined the Soci�t� des Arts et des Sciences de Carcassonne in 1888. He is the author of "La Vraie Langue Celtique" (1886) as well as "Du Nom de Narbonne" (1880) , "Remarques sur le Dialecte Languedocien" (1894) and "Le Livre d'Axat" (1896). "Notices historiques sur la ville de Limoux". � Doctor L. Buzairies - Author of a history of castles, according to the article. � Firmin Jaffus - Writer of poems, including one entitled "Notre-Dame de Marceille", according to this article. He appears to be the author of "Carcassonne et les tr�sors du Temple de J�rusalem" (Carcassonne, 1867). Monsignor de La Bouillerie, mentioned in connection with Firmin Jaffus, is the author of "�tudes sur le Symbolisme de la Nature" (Paris, 1867). The membership list for 1890 does not include these names as members of the Soci�t� des Arts et des Sciences de Carcassonne. 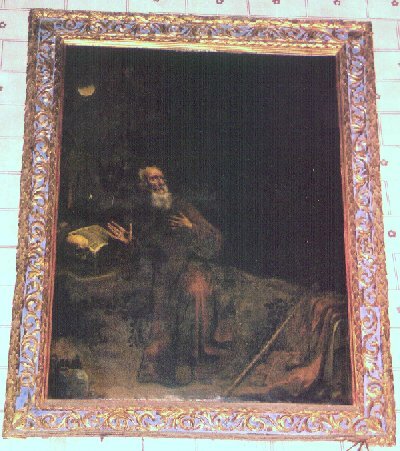 This article is the only known contemporary reference to La Tentation de Saint Antoine (The Temptation of St Anthony) in the church at Notre Dame de Marceille.